Alright you sub-elitists, I agree with you 99% of the time. But this is not one of those times. I encourage you, no, I IMPLORE you to watch the dub. The sub, it's not bad. But the dub, whoa mama. The delivery, the writing, the pure comedy, you will not be disappointed. This is truly a classic short format comedy anime. It's absurd but not the break-neck pace that a lot of current comedy anime use. Timing is important to comedy, and this show executes that perfectly. It is absurd and unpredictable, but each episode feels like a part of the larger whole. Very diverse in settings and situations. It has a lot of replay value for me, knowing the punchline doesn't ruin the joke. And yes, give the dub a shot. If you love surreal, absurd, pure Japanese humor, there's a reason this show has been referenced by other series over the years. It operates purely outside of the range of conventional humor, relying on the methodology of getting you drawn into a crazy situation that gets taken more and more seriously until finally the punchline arrives and you realize that you've just spent 22 minutes being told a single joke. That is, unless you're watching an episode that is just happily slapping you with out-of-left-field non-sequiturs that leave you wondering what it was exactly that you just saw. Some will find this pure suffering, others will laugh out loud as they get caught unprepared. You think the early seasons of Family Guy had 'random' humor? You haven't seen ANYTHING. Forget what you know about conventional comedic storytelling and let your sanity leak out your ears... or turn back before it's too late, because what you see from the first episode is exactly what you'll get for the next 24. You have been warned. Also, this is one of those mid-00's Adult Swim entries that proves that dubbed anime doesn't ALWAYS have to be cringey B-grade acting. Some of the voice talent from Ghost Stories make their return here, and it's just as funny. Final verdict: It cannot be stated enough, only watch this series if you love 'madcap' humor. Everyone else will just wonder what the hell was being smoked when this series was pitched, so, due to its niche scope, I have to take off one star because there are some jokes that DO fall kind of flat and are lost in translation. I've always liked anime about delinquents, but more than that, this show is seriously funny. It uses elements, such as violence, school, robots, the entertainment industry and more, that tend to be dark and portrays them in a way that wackily contrasts the sinister connotations of those elements and the stern faces (눈_눈) of the characters. I find the short format of each episode enjoyable and feel that the voices in the Dub really suit the characters and add another level of charm~☆ to the show. Overall rating: 3.3 out of 5 stars. Club chose to move on to the next series on list rather than watch the second episode. There are many animes that call themselves comedies but either use standard trope jokes or barely make you chuckle this anime is an exception. It's safe to say that this is one of the best anime comedies I have ever seen. The story starts with our protagonist Takashi Kamiyama just being transferred to Cromartie High, the problem is that its fill with hot-headed delinquents, a gorilla, robots, and aliens, the reason why he was transferred to Cromartie was... Well, you have to read the manga, no seriously they actually say you have to read the manga if you want to find out what happened(and it is hilarious). The thing that stands out with Cromartie high school is its budget. Were not taking frames per second here were taking frames per minute yet instead of that being a crutch the anime fully embraces it and it adds to the gags. I always watch this anime whenever I need a good laugh. I endorse this anime wholeheartedly, give it a try the episode are only 10 minutes long. Also, Freddie Mercury is in this. This is a truly precious hidden gem, that been hidden away in crunchyroll's roster, and the fact that so few people know about it toady is almost criminal. For an anime of the 2003-2004s, not only those the comedy of the show still hold up, for teenagers like me who have only recently found this anime, its comedy is extremely refreshing. The show's opening is honestly indescribably good. I refuse to spoil anything in this review. However, to fully appreciate the opening you have to watch a couple episodes; even though, the opening by itself is still hilarious. A very funny anime about high school delinquents! This gem of a show is about a high school boy who tranfers to a high school where all of its students, which are all male, who are delinquents or are thugs you could say. The high school these students attend is not your typical Japanese high school and have fun characters mixed in with the students that are human and are not human that add to this show's comedy aspect. The main character always writes back to his mother at the end of each episode in the next episode previews and addresses her always as, "Dearest Mother..."
I will note that some things, and I can only count two scenes so far that really stand out since I have only seen up to episode 17, may not be politically correct to say today since this anime was made back in 2005. One being where the main character and his friend say the word 'f*ggot(s)' as an insult to somebody and a character who is into comedy referring to his afro style haircut as "stupid", but still sports it anyway throughout the entire show. Of course, I have only watched the dub of this show which the characters say these words in, but I think this is something to note in case younger viewers get shocked by the colorful language featured in these scenes of the dub. Speaking of the dub, the dub is EXCELLENT. As other reviewers have said, I HIGHLY recommend viewers watch the dub of this series since it is so well done. The only glaring issue besides the scenes I mentioned before being politically incorrect is that the dub does edit the cigarettes the high school students smoke and maybe one or two other things as well I think from what I have seen so far. But mainly, the cigerettes. But besides all of the negatives I have pointed out from the show, this show's comedy is off-the-wall funny! You will definitely get a good laugh out of watching this show and its memorable characters. A real gem of an anime! I highly recommend everyone watch this fantastic show! Colin from The AniMonday Podcast here! Each week we hit the "random" button on Crunchyroll, and must watch whatever pops up. 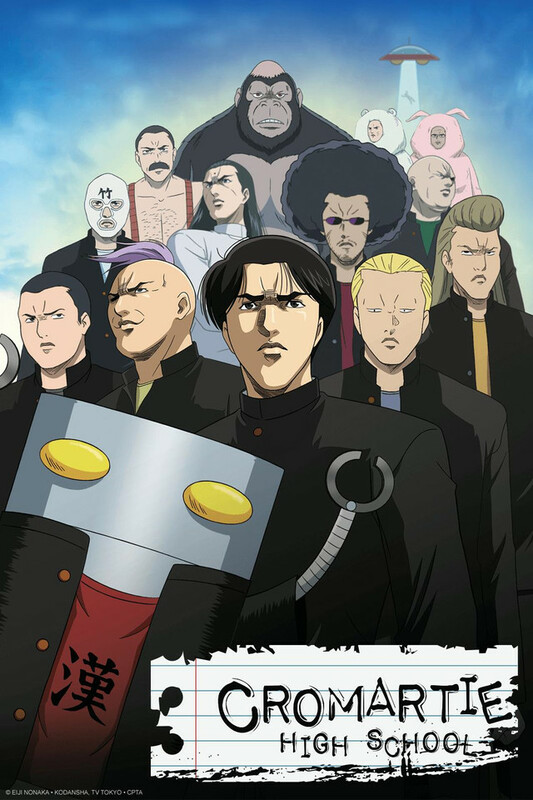 We did a podcast about Cromartie High School that you should definitely check out, whether you've seen a couple of episodes or not!